Local is a focus in all our departments, but stands out especially in our cheese selection. We offer a heavenly assortment of Vermont-made cheeses, including Plymouth Artisan, Grafton Village, Neighborly Farms, VT Creamery, & many more. We are constantly on the lookout for ways to expand our selection! We participate in the “Cave to Co-op” program, a partnership between the Neighboring Food Co-op Association, distributor Provisions International, and New England’s artisan cheesemakers. This wonderful program works to provide area co-ops with a new, regionally-made cheese each month. Check out this month’s highlighted cheese below! If you are looking for a special cheese, or have any other questions, call us at 802-885-3363! We’re happy to help you find the cheese of your dreams! 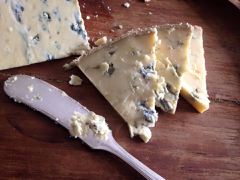 “Mad River Blue is a natural rind, organic cow milk cheese by Sebastian von Trapp, cheesemaker. From 1959, when Werner and Erika von Trapp purchased the von Trapp Farm, it has been a working dairy. Over the course of three generations, the farm has transitioned to a certified organic dairy and in 2009 added cheese making to the value-added operations. Striving for high-quality standards, the von Trapp Farm produces some of the sweetest organic milk for its premium cheese production. The family is committed to making the highest quality cheese with the best milk possible, using traditional methods of small-scale production and continually striving to improve. Their mission is to be one example of how to make a small family farm in the center of Vermont economically viable by producing delicious organic small batch cheeses. In 2015, Mad River Blue won a Good Food Award. These awards celebrate the accomplishments of authentic food producers who combine great flavor with environmental and social responsibility. The cheese is appropriately named for a variety born in the Mad River Valley. In 2016 Mad River Blue won second place at the American Cheese Society Awards. You can read more about the Cave to Co-op program here!